I went to the ep launch of "jasmine rice" by jack diaz this evening. she is quite quaint and quirky. 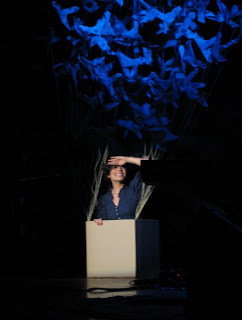 her stage had moving clouds and an air balloon made out of newspaper birds and cranes. if i were a boy i would have fell in love. keep your eye on her. Hi, Do you know anything about when the album will be launch on iTunes? It's difficult to find any info about this singer as i found her music randomly on youtube.